Thanksgiving is all about turkey. Christmas dinner? You’re eating ham. Another long-held American tradition? The Super Bowl party and copious amounts of chicken wings. Buckets full. The you-can-never-get-enough barroom staple is, by far, the most important Super Bowl Sunday party menu item. 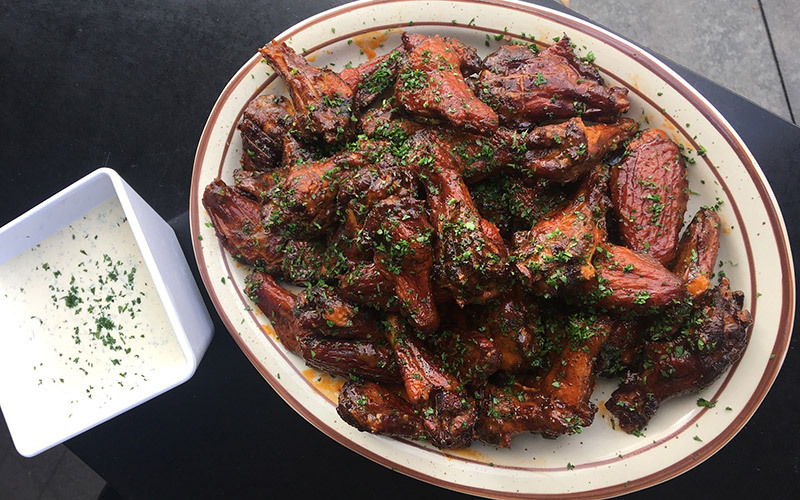 Well hang on to your queso and seven-layer dip, because Micah Wexler and Michael Kassar, the kings of Jewish soul food over at Wexler’s Deli (DTLA – Grand Central Market/Santa Monica) are taking their years of expertise smoking fish and pastrami in-house and expanding their vision to include … chicken wings. First. Time. Ever. They are making pastrami-spiced, slow smoked, free-range chicken wings in time for your get-together the day of the Super Bowl. The little gems also come with house-made Buffalo and Ranch and will set you back $12 for a dozen (peanuts). Want some? You can place your order before game day (Feb. 5) by calling 424.744.8671 ext. 1 or by emailing them at catering@wexlersdeli.com. They are also offering good-looking braised brisket sandwiches for game day, but we didn’t make it past wings. Pastrami-spiced wings. Slow smoked. It’s all too much goodness. Kari Mozena is the Special Projects Manager at Los Angeles magazine and LAMag.com. You can follow her on Twitter and Instagram. She wrote Shake Shack Burgers Are Free In L.A. If You Do This One Thing.